The Engaging Research training I completed in March 2017 didn’t feel like work, but the fact that the week was fun doesn’t mean that the skills and discussions we had during the training weren’t really valuable and important. Over recent years, the change in weighting of required research outputs has given much greater importance to engaging end-users outside of our academic spheres with our science. A lack of wider engagement can even impact on whether your research gets funded. 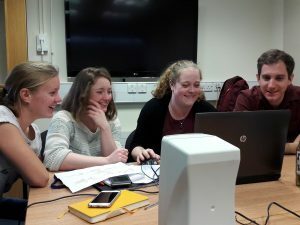 As PhD students at the beginning of our academic careers we are at a advantageous point where we can decide if we want to incorporate engagement activities into our work and really embrace this movement from the outset. Kate Baker and Lucy Garrett discuss the relative merits of engaging research. Photo: Richard Holliman. Should I spend time engaging people with my research? For me the answer to the question, “Should I spend time engaging people with my research?” is an easy one. I’ve always found communicating my science to a non-specialist audience very rewarding for a number of reasons. Firstly, there is just something magical about seeing the penny drop for people, especially when you’re explaining the bizarre and complex concepts behind the formation of metamorphism of rocks. But on top of this I have had some fascinating conversations, which have helped me to work out what are the most important aspects of my research. These discussions have prompted me to think about how I direct my research in the future. The week-long workshop did a fantastic job our skill sets. I left the workshop more confident in my ability to produce and star in short films. Examples of the films produced through the workshops are available by accessing the playlist below. In a complementary way, the workshop also prompted interesting discussions about whether PhD students should engage, and what priority we should attach to these activities. The main issue is that we are all time pressured and the main goal of a PhD is the thesis and accompanying papers. It’s very likely that, as a postgraduate researcher, you might feel like you have no time to squeeze in a talk like the one I did recently for local schools (Mountains under the microscope), or a more interactive activity. 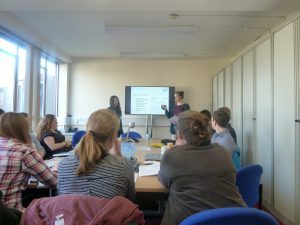 However, the workshop highlighted, that there are a multitude of different techniques and approaches you can use to engage people with your research. Your engagement and communication could be a simple as a blog post, or tweeting silly pictures of you doing your lab work (my twitter feed… all the time). Or go nuts and get creative! Editing our film. Photo: Lucy Garrett. The trick is to plan for your engagement, connecting the people, purposes and processes in ways that either improve the quality of your research or the social and economic impacts that emerge from it. In an ideal world, your engagement should improve both. The following link takes you to a page of resources to help you plan ahead: Engaging Research, a Collection of Training Resources. On reflection it was a brilliant workshop, with some top class guidance, plus we ended up with some side-splitting outtakes. If you’re interested – particularly in short film making skills, or brushing up on interview technique – I’d definitely recommend booking yourself onto this workshop the next time around! P.S. I’m now taking the plunge and starting up a new podcast all about fieldwork. It’s called Fieldwork Diaries and you can find us on Twitter @FieldworkDiary – stay tuned here and wish me luck! The professional development workshops discussed in this post were funded by NERC through an Innovation Award (NE/L002493/1), and delivered by (in alphabetical order) Kate Baker, Victoria Burton, Lucy Garrett, Gerard Giorgi-Coll, Georgia Hole, Richard Holliman, Kerry Reid, Janet Sumner and Clare Warren. Where relevant research findings and experiences from other similar workshops funded through an award made as part of the RCUK Public Engagement with Research Catalysts (EP/J020087/1) and a further award made through the RCUK School University Partnership Initiative (EP/K027786/1) were used in delivering the Engaging Research workshops. Holliman, R. and Warren, C.J. (2017). ‘Supporting future scholars of engaged research’, Research for All: Universities and Society, 1(1), pp. 168-184. Available from: http://oro.open.ac.uk/48223. This entry was posted in Training and tagged Blogging, engaging research, lecture, Media, NCCPE, NERC, PhD, postgraduate research, public engagement, Public engagement with research, social media, Web video on Tuesday, 9 May 2017 by Eleni Wood.